Every week, Short Cuts reviews one newer and one older film from the wide world of short cinema, from the extremes of the avant-garde to the cultural ephemera of industrial films. In a 2010 interview with Ananda Pellerin for the website Wheel Me Out, avant-garde filmmaker Michael Robinson describes a couple of the formative experiences of his boyhood: discovering the secret moves and levels in Nintendo games, and watching David Lynch’s TV series Twin Peaks. That sense of peering behind façades and finding something alarmingly new—shared by Lynch and Super Mario Bros.—is plainly evident in Robinson’s sensational 2007 short “Light Is Waiting,” which methodically pulls apart an episode of the ABC sitcom Full House and reconfigures its core visual and audio elements until the show splinters into a psychedelic nightmare. Recontextualizing popular culture has been Robinson’s specialty since the mid-’00s, when his work first became a staple of avant-garde film festivals and modern-art museums. (Though only in his early 30s, Robinson has already been included in The Whitney Biennial, and his shorts have been shown at The New York Film Festival, Sundance, Rotterdam, The London Film Festival, and more.) 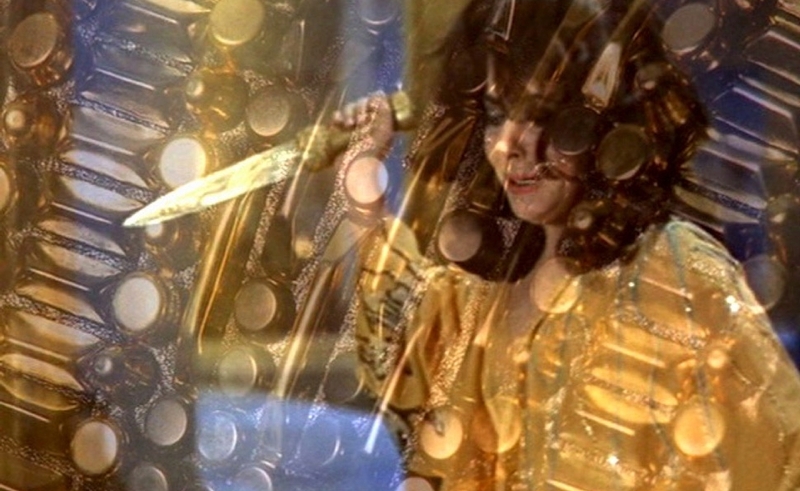 The 2010 short “These Hammers Don’t Hurt Us” is one of Robinson’s most powerful films, splicing together clips of Elizabeth Taylor in Cleopatra and Michael Jackson’s “Remember The Time” video, to suggest a version of ancient Egypt where Taylor is Isis, Jackson is Horus, and they’re fleeing the dangers of the world together. The opulence of these two productions—the Hollywood epic and the multi-million-dollar music video—become a kind of weapon against their two main inhabitants, threatening the stars with sharp edges and piercing sparkle. The linking animations of computer-modeled landscapes, shapes, and portals enhances the elegiac cast of “These Hammers Don’t Hurt Us,” as do the intense flickering effects in its final minutes, which evoke the feeling of an entire era slipping into oblivion. Found footage has been an integral part of avant-garde filmmaking from the early days of film, thanks to groundbreaking experiments like Joseph Cornell’s 1936 short “Rose Hobart,” which transformed a battered print of a Hollywood jungle adventure into a fetishistic study of its lead actress. Austrian filmmaker Peter Tscherkassky is part of a wave of artists (including his countryman Martin Arnold) who treat raw film the way sculptors treat junkyards. Tscherkassky doesn’t just sample and remix old movies; he alters and distorts their physical form until the base mechanical nature of film itself becomes an inextricable, sometimes terrifying part of the experience of watching his pieces. Tscherkassky’s 1985 short “Manufraktur” is one of his first, made just a few years after Tscherkassky first discovered avant-garde film at age 19. Tscherkassky in his mid-20s was less aggressive in his manipulations than he later became, but “Manufraktur” is still plenty unnerving, right from its jittery opening title card. Tscherkassky takes footage of automobiles and picture of hands and then cuts, duplicates, superimposes, juxtaposes, degrades, and repeats it all, matching the images to an overly loud, skipping soundtrack. At a slower speed, “Manufraktur” might inspire viewers to contemplate the complex interrelationship of man and machine. At Tscherkassky’s white-knuckle pace, the film is like being behind the wheel of a car that’s skidding out of control around a steep mountain curve. For the whole of its running time, “Manufraktur” is as thrilling as any Hollywood chase scene.